This post is going to be a little bit like a ball of Faroese wool that I managed to knot up while I was aboard the Johanna TG 326 with the The Clipperton Project. So please be patient dear Reader as I attempt to unravel my tangled thoughts, connections and reflections. Yesterday was our last full day as a group together on the Johanna and it was truly special for a several reasons. Firstly, we had the immense privilege of working together with the crew to haul up the sails and sail for a couple of hours around Tórshavn. It was also one of our team members birthday, Nils Aksnes, who enjoyed being at the helm while we were sailing. Also, we visited the Island of Nólsoy which was very lovely despite the rain. 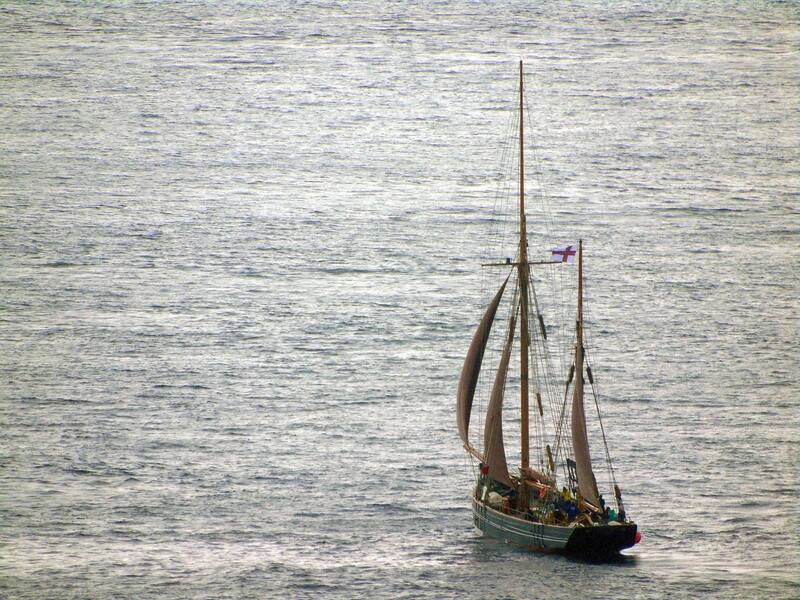 What was also magic was local photographer Ingi Sørensen catching us with the sails up. It was serendipity that he happened to be looking out his window at home and spotted us. Check out this fantastic photograph. One of the other wonderful things was a rich discussion about phenomenology and ideas of place, home and the everyday with a couple of other participants last night. I have grappled with a lot of different thoughts about how to engage with this place as an artist, particularly in the context of identity, the environment and storytelling. 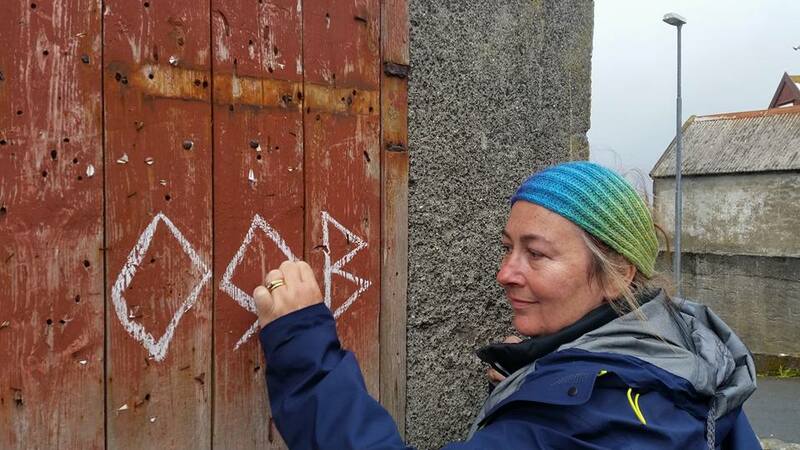 Although my Rune chalk drawings have been a way to try to connect with the Faroes and reference the Viking history as well as my personal connections to ancestors: it is definitely problematic. Now, I don’t mind my work being problematic, I enjoy discussion and questioning that can evolve from conversations about my work. In many ways, my interest in creating knots or problems has echoed through my practice over many years. Big Banana Time Inc, Fauxonomy and Scalpland were all projects that tangled thoughts about art, the body, place storytelling and identity in different ways. Anyway, it is worth sharing some of the knotty bits of the Traces in the Landscape works/interventions. The first knotty bit is the actual drawings themselves – they could easily be perceived as vandalism, even though the materials I use are temporary. The second knot is about the symbols – Runes are still used as a form of channeling and as such have power. Now I don’t portend to use them in this context at all. I was reading them on a daily basis and it was one of the few routines I was able to maintain on the journey. Another tangly bit is the chalk itself – although it is temporary and the chalk was purchased in Tórshavn, it is not from this place, being made in China. The big knot is more connected to my interest in working on issues around sustainability and engaging in interdisciplinary programs in far-flung places. I have written earlier about my desire to work on projects that link my disparate worlds as well as working closer to home. As time goes by, I find it harder and harder to justify my love of new horizons with my CO2 emissions. Just my flight to Copenhagen return dumped 2.33 metric tonnes of CO2 into the atmosphere. It is not easy for me as an individual to abate that amount of CO2. For example, a tree can absorb as much as 48 pounds of carbon dioxide per year and can sequester 1 ton of carbon dioxide by the time it reaches 40 years old. The Faroes are also very reliant on regular rainfall for their water supply and I was very surprised to learn that every day on the Johanna we were using 5 tonnes of fresh water – for drinking, washing and the toilet! On the other hand, the water from the tap was safe to drink so at least we were not buying water in plastic bottles. I abhor consuming drinks from plastic – especially since giving up fizzy drinks a number of years ago. Ironically, when I gave up soft drinks (soda) it was for health reasons – I only realised later that there was a positive environmental benefit to this change in my behaviour. One of my overarching goals as an artist and human bean is to reduce my cognitive dissonance and be more mindful of the impact that my life choices have on the environment. It is certainly the tangliest of knots that needs to be unpicked. These issues will certainly be rich food for thought over the coming weeks at the SIM Residency.